Off-axis Digital Holographic Microscopy (DHM) is an emerging and promising optical technique that is capable of high throughput and sub-micron imaging of complex liquids. A joint effort between Caltech and NASA/JPL has resulted in the development of a DHM instrument that has been deployed to Greenland, the Arctic Tundra, and even Death Valley CA to search for life in some of the most extreme locations on Earth and eventually the solar system. This device continues to be developed to search for life in the far reaches of our solar system but also has a crucial role close to home. Instead of looking for bacteria on other planets, we can look for bacteria in ourselves. With the high sensitivity of DHM, early diagnosis of sepsis and other infectious diseases can greatly increase the quality of care provided at hospitals across the world. Manuel Bedrossian received his Bachelor’s degree in Mechanical Engineering from the University of California, Riverside in 2015. In 2017, he received his Master’s degree in Medical Engineering from the California Institute of Technology (Caltech) where he is currently a PhD candidate. 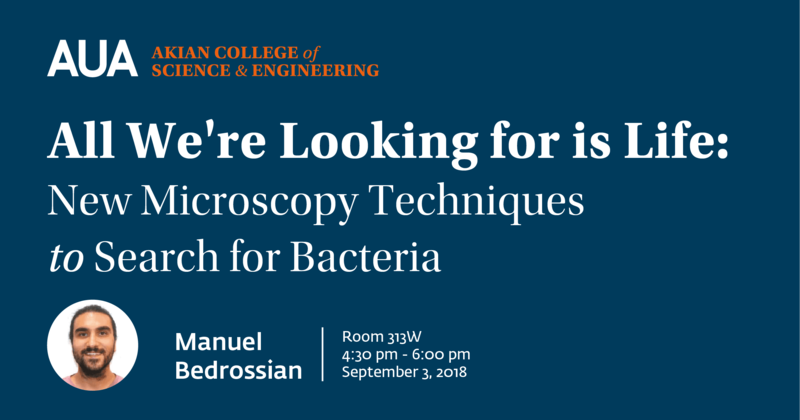 His research focuses on the development of optical techniques, both hardware and software, to detect and identify bacteria in complex fluids.